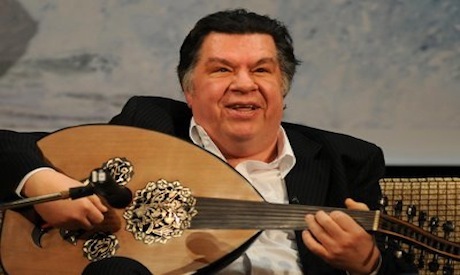 On Friday 7 December, Egyptian musician, Ammar Al-Sherei passed away at Cairo's Al-Safa Hospital, at the age of 64, over two weeks after having cardiac surgery in London, leaving behind a wife and son. For many years, Ammar Al-Sherei was one of the brightest stars on the Arabic music scene. As composer and performer, Al-Sherei was a remarkable artist and will be remembered by many for his unprecedented talent, skill, musical knowledge and many human values that touched everyone who came across his life path. Ammar Ali Mohamed Ibrahim Ali Al-Sherei (known as Ammar Al-Sherei) was born on 16 April 1948 in the village of Samalot, 25 km from Minya in Upper Egypt, to a large family of Al-Shereis. His father was Samalot's umda (or mayor). Coming to this world blind, his sensibility and development depended on sound, and among the first sounds that held his attention were the folkloric songs sung by his mother and the voice of a muezzin's call to prayer from the nearby mosque. The family moved to Cairo when Ammar was five years old. He was enrolled in the Demonstration Centre for the Rehabilitationand Training of the Blind (DCRTB), in the neighbourhood of Zaitoun, a special-needs school opened by the Point Four Program, a United States aid programme for developing countries. At the time this was the only institution providing education to blind children in the Middle East. It was later on that Al Nour Wal Amal association for blind girls opened, and soon after initiated musical education for the blind. While Al Nour Wal Amal concentrates on the Western classical music, the DCRTB offered Oriental music education. Al-Sherei was enrolled in a boarding school for the primary, preparatory and secondary stages, before pursuing his university studies at Ain Shams University's English Department. When the Point Four Program was cancelled by Gamal Abdel Nasser, the centre for the blind was taken under the joint umbrella of the Ministry of Education and the Ministry of Social Affairs. Ammar's musical gift was apparent from his very first days at school. His teachers were enchanted when they heard him sing Lailatul Qadr, a well-known classic about the night of the revelation of the Quran, at the age of five. Realising that music was Al-Sherei's main vocation and an absolute passion for him, several teachers impacted his early education, opening up to him the wide horizons of music and its wonders; Al-Sherei would always recall teachers such as the late Sayed Hassanein and the late Ibrahim Hosni, both also blind musicians who left a mark on his first steps in music. Another teacher, Abdalla Mohsen, helped Al-Sherei develop contacts with the Hadley School for the Blind in Illinois (USA) where he studied for several years by correspondence. Later on he obtained certificates from the Royal School of Music in London. Further intoxicated by music, Al-Sherei would spend 10, even 12 hours a day practicing oud, piano or accordion, studying all aspects of music. During the years spent at the DCRTB, he performed under the centre's umbrella in a variety of locations across Cairo. And even when he departed for the university, his links with the school remained strong. He kept returning there throughout the years as a beloved colleague and student, even when he had already made his name as a well-known composer and oud performer. Al-Sherei's choice of the English Department was partially a reflection of his parents' view that he should have have a "serious" career beyond music. Al-Sherei's mother valued music as a hobby but, as she believed, music could not be a profession. In one interview Al-Sherei recalls how his mother would be upset, calling his performances "backing the belly dancer". As much as Al-Sherei's positive attitude to life helped him enjoy university as he mastered English language, he knew that music was what his life was about. He graduated in 1970, but alongside his studies, he continued performing with a group of colleagues doing small gigs here and there, joining numerous bands. Al-Sherei started composing while still at school. In 1975, during a casual event, Maha Sabry, actress and singer, heard Al-Sherei sing Emsek Al-Khashab (Touch Wood) and immediately grew interested in the song. In no time the song, popularised by Sabry, brought Al-Sherei into the limelight. Many doors started opening while directors and singers started asking Al-Sherei for compositions. In the following decades, he wrote music for over 50 films and 120 television series, working with many renowned Egyptian directors. His scores were awarded numerous prestigious Arab and international awards. He also composed over 150 songs for most of the major music stars of the Arab World, including Warda, Latifa and Ali El-Haggar. As his career started taking off, he also found reconciliation with his mother, who was finally convinced that music was in fact a crucial factor in his existence and the reason he was respected and cherished, besides the fact that he would never give it up. The following years were nothing but a string of further successes. In 1980, Al-Sherei formed a band called Al Asdeqa (The Friends), bringing together singers Mona Abdel Ghani, Hanan and Alaa Abdel Khalek. Friends became among the most successful pop bands in Egypt in the 1980s performing Al-Sherei's compositions, which blended traditional Arabic music with modern sounds and featured lyrics addressing contemporary social issues. Apart from his continuous work for film and television, every year between 1991 and 2003, El-Sherei was the musical director of the 6 October national celebrations. In parallel, he was often commissioned to compose music for the national events of the other Arab countries. Moreover, El-Sherei was among the very few composers who wrote a concerto for oud and symphonic orchestra. Even when very busy with films and TV series, children played an important role in Al-Sherei's life. Not only do his compositions include songs for children, he was also involved in discovering, supporting and developing young talents. Al-Sherei willingly took on challenges as he went along. One of the interesting collaborations was with a Japanese company that worked on creating tables for quarter tones to be fed into a microprocessor for computerised electronic music. In other words, Al-Sherei helped identify and classify into maps a wide range of quarter tones depending on the music of a given Arab region and instrument, a very complicated and detailed process that required a brilliant ear and musical abilities to capture all the nuances. But his dynamism did not stop there. Another unique side of Ammar Al-Sherei was his ability as a storyteller, whether among friends or in public. For over 20 years he starred in a radio programme titled Ghawas Fi Bahr El Nagham (Diver in the Sea of Melodies) in which, every week, he invited listeners to a range of journeys through Arabic music. The programme was a success and introduced millions of devoted listeners to the beauty of music through stories about its history, analysis of compositions and lyrics. Though totally dedicated to music, Al-Sherei attentively followed all the events happening in the country. He was among the few big names in the arts world to call openly for Mubarak to step down during the 2011 revolution. In early February 2011, he joined the Committee of Wise Men or "the dialogue committee" consisting of intellectuals and businessmen and aiming to discuss the power transfer. While Al-Sherei's appearances among the protesters in Tahrir Square were received with great enthusiasm from his fans, they reportedly also cost him serious deterioration in his already precarious health. Al-Sherei's history of cardiac trouble was very long; he had been through more than one open-heart surgery and multiple catheterisations. While his positive spirit and music helped him cope with blindness, which he referred to as "a friend and a foe", his prolonged heart condition proved his strongest and final enemy. Al-Sherei inspired many artists and researchers. Seven master degrees and three doctorates in different universities – in Egypt and abroad – chose him and his music as the topic of their studies. Ammar Al-Sherei was not only a great musician who left imprints in everyone's hearts, he was also a man who joined his natural talent with hard work and perseverance to express his passion: a man of great musical knowledge and skill. Al-Sherei's contribution to the music scene is now a great legacy that will be cherished and passed from one generation to the next.